As veteran FO Lt Don Keith once said, "In Vietnam, you must always avoid STUPID!" Well....that's easier said than done, I guess. I was very impressed with the original version of GI adhesive tape that arrived on the Army scene in the sixties. It had an outer green cloth covering with the black, tar-like substance underneath. 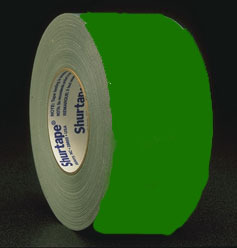 You might call it the forerunner of what we know today as the commercial variety of "duct tape". That stuff was fantastic!! It could hold a tank together until you made repairs later. It represented the some of the "good stuff" sent out to the field at the time. You might even say that government procurement contracts were really "worth a hoot" back then. Naturally, this tape was in great demand. You could use it for anything and everything. I was fortunate enough to have a roll squirreled away in my bunker at the firebase. Only problem was that the roll was 3" wide. Being raised in a family of ten and taught "waste not, want not" all my life, I would have preferred something like an 1-1/2" width roll instead. Certainly didn't want to waste this valuable resource! So...what to do? Of course! Cut the roll of tape in half! Well, you're probably two steps ahead of me now and guessed that the knife blade was gonna slip off that roll of tape and I was gonna stab myself. It did. And I did. The tip of the knife blade entered my thigh. However, I did avoid STUPID to the point where I was not bearing down so hard that it might look like a failed suicide attempt. But...it did need medical attention. So, the unit medic strolls over, checks out the damage, and tells me that a "butterfly" should do the trick. Well, I never heard of a "butterfly" bandage before, so I learned something else that day besides STUPID. And, I had the occasion later to teach others what a butterfly bandage was. The day wasn't a total loss. The "doc" finishes up and then he hit me with the totally unexpected question: "Do you want me to sign the papers for your Purple Heart?" I was completely astonished and dumbfounded! He was dead serious! Being a good agent of his profession, he obviously knew the guidelines for the award and felt that I was a candidate for same. I told him "NO WAY! In fact, I'd like to forget that this even happened!" In the passing years, I would occasionally wonder what would have happened if I had accepted the Purple Heart medal.